For a couple of hours that day, it didn’t rain after that beautiful sunrise captured earlier. 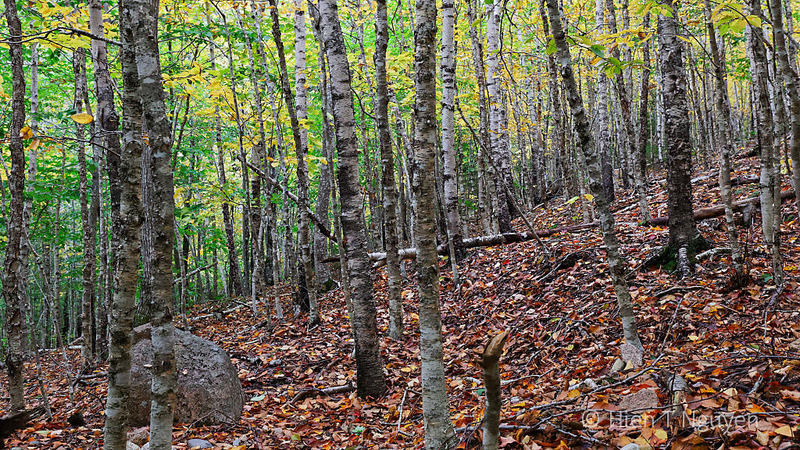 I went for a short hike to South Bubble mountain, one of the two small mountains that are visible from Jordan Pond. The Bubbles as seen from the South end of Jordan Pond, near the entrance. The Bubbles from Jordan Pond. The hike to Bubble Rock on top of South Bubble was short and not too strenuous, even when the ground was not completely dry. Trees and a boulder seen on the way up to South Bubble mountain. At the top was a big boulder perched on the mountain rocks, looking like it was ready to tumble down to the road or the gorgeous valley below. 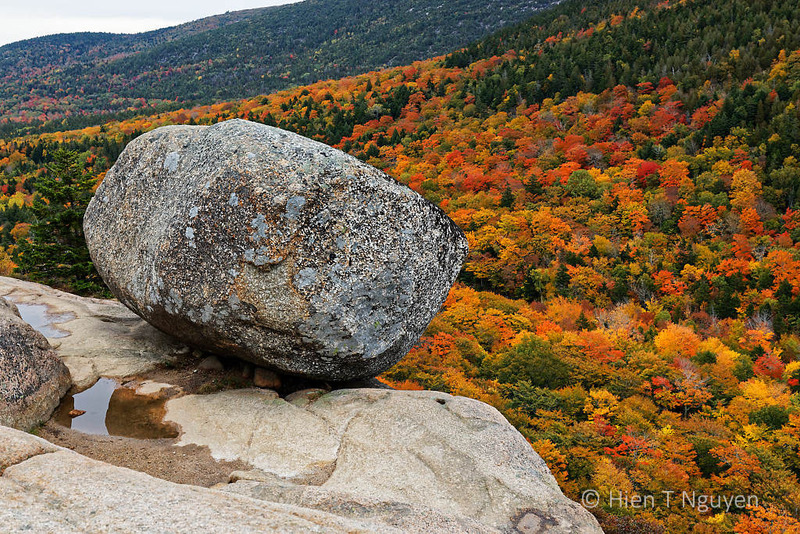 Bubble Rock was moved there a long time ago by a glacier that carved out what is now Acadia National Park. And here’s the million-dollar view from Bubble Rock. 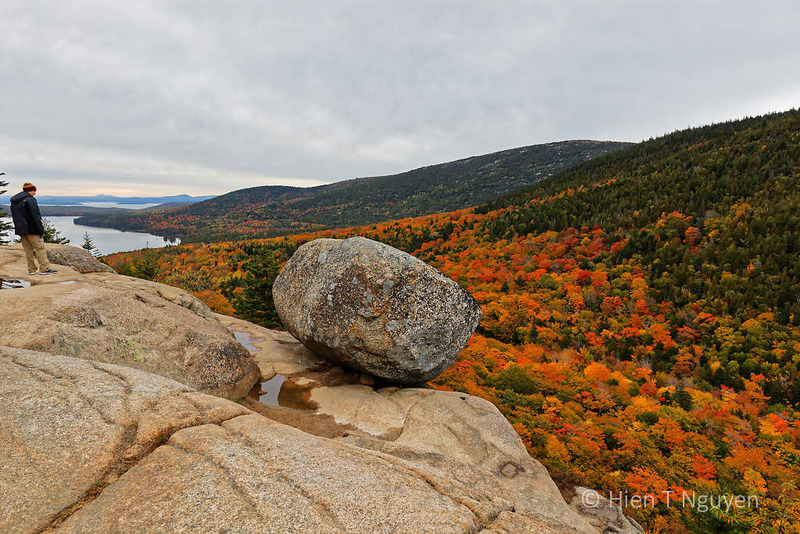 View from Bubble Rock looking toward Jordan Pond. Stunning vistas, I am mesmerized…. Excellent shots! Thanks Donna! I only wish the sky was not so pale and cloudy. More gorgeous images! I hope you’ll print some and hang them up. The reflections, the textures of the rock – wonderful! Thanks! I will print some indeed, to hang around the house. Thank you! Glad you like these pictures. Its all very beautiful. 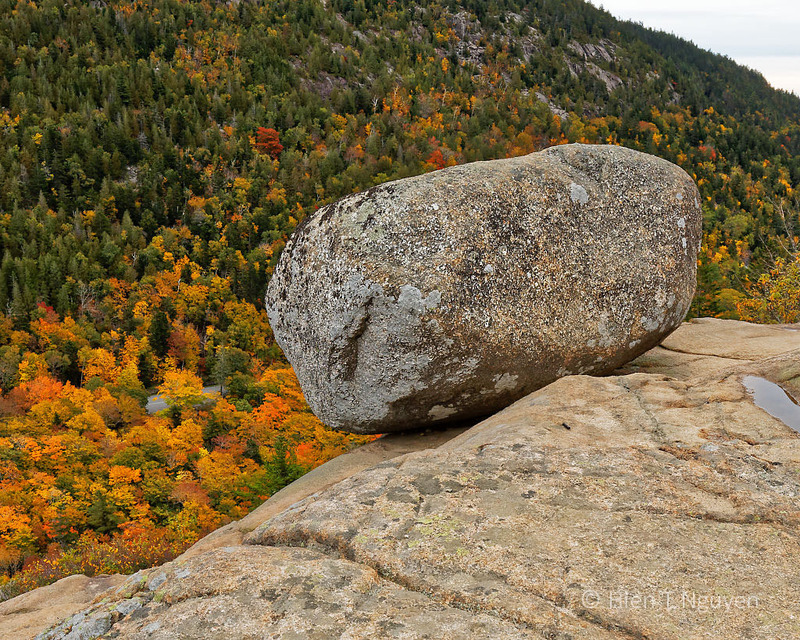 I am worried that some idiot will push bubble rock off the hill. I think this has happened elsewhere. Emma, many visitors have tried to push the rock, sometimes several of them ganging up together. So far they have not been able to move it an inch. I think short of a major earthquake, the rock will not budge. That’s good to know (the not budging bit). I am quite depressed that groups of people have tried to push it down hill, though. They don’t have a chance. That boulder weighs 19 tons! So glad the weather held so you could bring us these, Hien! Thank you Dries! That day it was only dry for two hours, and the rest of the day was rainy and drab. Wow, it looks like you hit peak foliage season. Stupendous views! These are stunning! You may not have had the best weather during your trip, but from the amount of color showing from the trees, it looks like your timing was perfect. 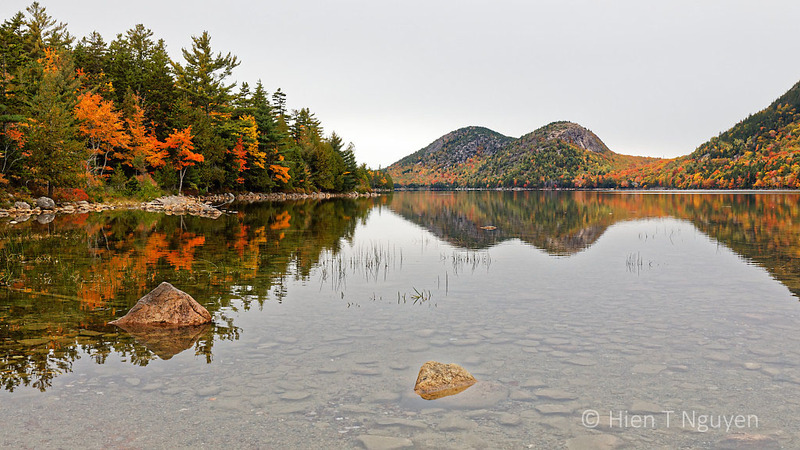 Timing is everything for leaf-peeping, and even though I had planned this trip several months ago, I think I arrived in Acadia at peak time. Wow, Hien — such a glorious park. Your photos are stunning. Thank you very much, Jet! 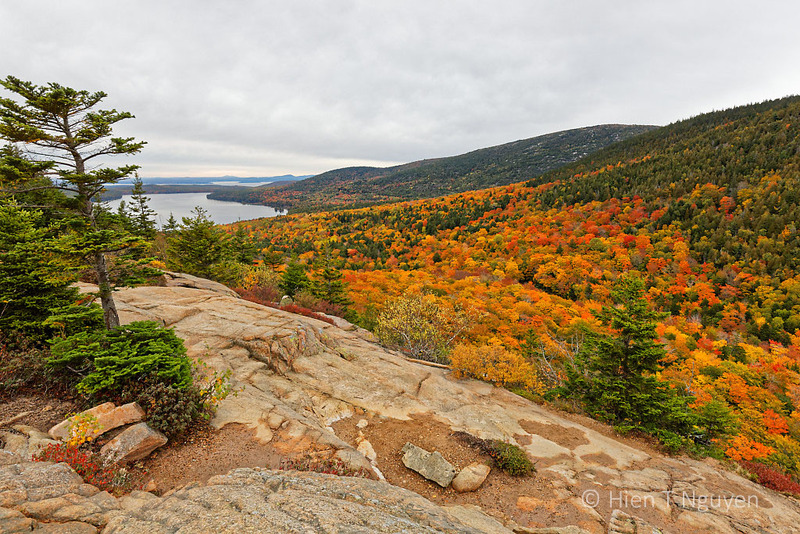 Some great colors there, I need to visit Acadia! 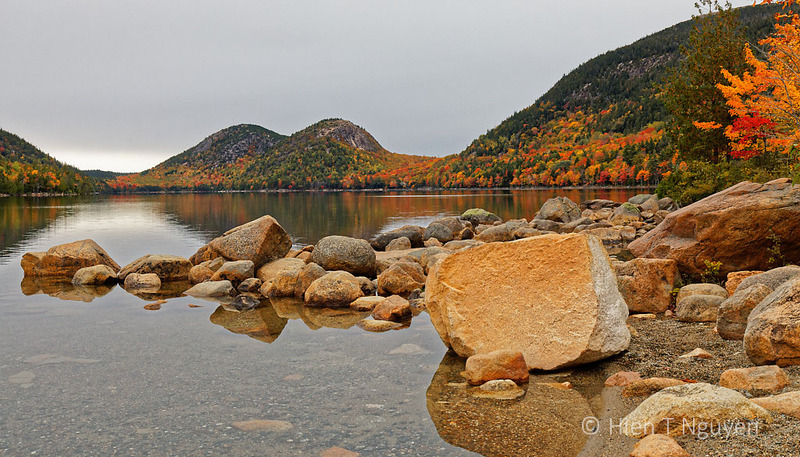 I do hope you will get a chance to visit Acadia! What lovely photos! We have been watching “Autumnwatch” New England on PBS. It is so exhilarating! Enjoy and please continue to share your photos. Such beautiful colors. In person it must be amazing. Indeed, the experience was humbling when I got to the top and saw the magnificent vistas in all directions. Thanks Katelon! The views took my breath away! A perfect way to start the weekend. I am enjoying this series very much! Thank you Takami, and I hope you have an outstanding weekend!